This being the first small box expansion (indeed, the first expansion of any kind) for Eldritch Horror, I was looking forward to seeing what it had to offer. Forsaken Lore does not disappoint: this is a well done expansion and a good sign of things to come. [b]Ancient One:[/b]: Let’s start with what for a lot of people is the biggest element of this expansion: Yig, Father of Serpents, who becomes the fifth Ancient One for the Eldritch Horror game. Yig has by far the shortest doom track (10) but as an interesting twist, investigators who are defeated after Yig awakens are not eliminated from the game as with other Ancient Ones. So while Yig is pretty likely going to wake up, at least he won’t whittle your team down afterwards. Of course, this is Eldritch Horror so that might just mean your entire team will be up and about when the world comes to an end. [b]New Conditions[/b]: There are two new conditions of note in this expansion. The first is Poison, a form of illness. Needless to say you’ll see this one come up a lot in a game where Yig is the Ancient One, but it can also crop up in other games as well. The second is Lost in Time and Space, which has the unique (and unsurprising) effect of temporarily removing an investigator from the game. Basically, until it is resolved, your investigator is removed from the board, can’t affect or interact with anyone/anything, and is unaffected by anything short of the game ending. [b]Cards, cards, cards! :[/b] As one might expect from a small box expansion, this one is loaded with new cards. There are 148 encounter cards for Yig and also for the existing decks, a half dozen new Mythos cards, and over a dozen new Mystery cards. Some of these, naturally, are for Yig but there are also new mysteries for the original game Ancient Ones. I liked this about the expansion, as it shows that FFG will be trying to keep the existing Ancient Ones fresh and new as they introduce new game mechanics and additional Ancient Ones through expansions. There are also more assets, artifacts, and spells. To round out the box, there are also some new monster counters (mainly new epic monsters) and a handful of additional health and sanity counters. I liked this expansion. It has a well developed theme, well thought out cards and mechanics, and integrates smoothly and easily into the Eldritch Horror game. Well worth buying, unless you’ve got a problem with snakes. This adds just a few ancient ones, a few new investigators, and their associated cards. However, it add a lot of cards for the main game: locations, clues, gates, exploration, assets, spells, and so on… It is a welcome addition so you do not get bored when sitting on one location on the board. You will learn to hate the poisoned condition… This alone makes Yig one of the hardest ancient one to beat. 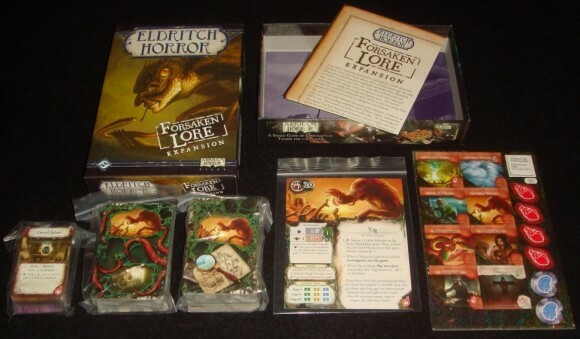 Add a Review for "Eldritch Horror: Forsaken Lore"